What Kate Baked...and baby! : The Wedding Cakes! After 'What's the Dress like? ', it was the second Most Frequently Asked Question About Our Wedding. Perhaps it was because I'm known for my insatiable sweet tooth. Possibly it was because I write a baking blog. Of course, firstly, I contacted the experts. Unfortunately, Mary Berry was busy writing her one thousand two hundred and fiftieth cookbook. Dan Lepard was down under. And both Nigella Lawson and Paul Hollywood were too distracted by affairs of the heart occupying newspaper headlines (it would seem terribly inappropriate to discuss wedding cakes, of all cakes, under such circumstances). So I turned to the rich-n-famous. I could be inspired by fashion, Hollywood glamour and influenced by royalty. Or simply be overawed by height (a seven ft for a wedding cake, really?!). In the end we I decided on a Cake Table. Much to the disappointment of some of our more literal guests, this wasn't a table made out of cake but a table groaning under the weight of all our favourite cakes! Long evenings were spent narrowing down our favourites and compiling and testing recipes. The baking proved very much a family affair. While I excitedly finished work, deliberated the ratio of bikini to mosquito spray for the honeymoon (2:3) and considered a last minute fake tan (I went for the English Rose Welsh Daffodil look in the end) Mum began the baking. We arrived home to full-to-bursting freezer. The day before the wedding we commenced the 'Welsh Cake Production Line', made pounds upon pounds of various flavour icings and tried desperately not to taste-test too much of the tiffin. Dad sliced, my sister, sister-in-law and I iced and my brother packed and stacked. Talk about team work. The Apprentice's Lord Sugar would be suitably envious. We had Carrot Cake, heart-shaped Welsh cakes (aww! ), Brownies, mini Victoria Sponges, tiffin, Bara Brith, Coconut Squares, Coffee and Walnut cake, battenburg, Cupcakes, Lemon Drizzle Cakes and a lovely two tier iced Fruit Cake for cutting (pictured up top)! 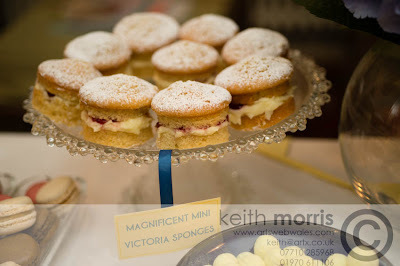 Each were placed on lovely glass cake stands and the table decorated with blue hydrangeas and yellow bunting. On the glorious Wedding Day itself, the cakes were the dessert during the wedding breakfast. 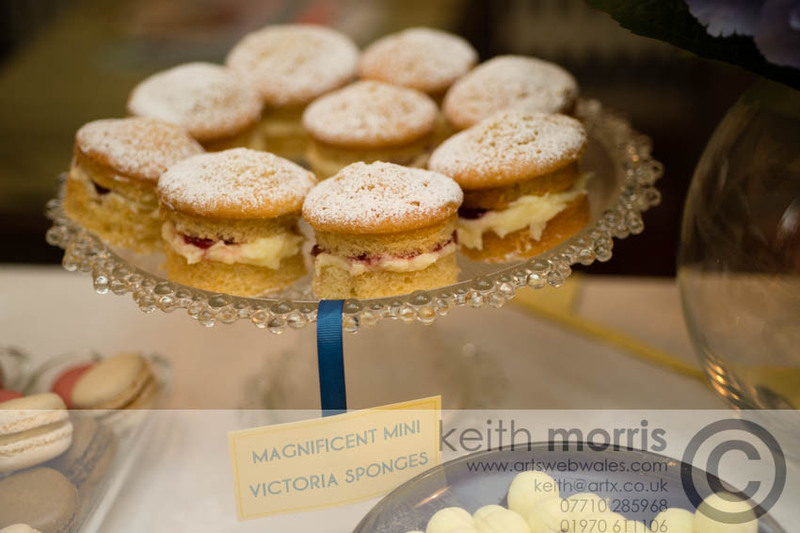 Each table were presented with a three tier cake stand with a delicious selection of the cakes to pick-n-mix from. I was informed afterwards that it became very competitive on certain tables! The Welsh Cake recipe can be found here. The carrot cake recipe here. If you fancy a bit of Bara Brith, here's the recipe. 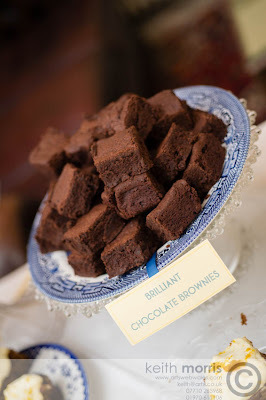 And we used Delia's fine fruit cake recipe and Nigel's recipe for Brownies which proved so popular, as always. And as for the other cakes I will post them here over the next few months. 1. Line a 20cm x 20cm square tin with cling film. Pop the raisins in a small dish and pour over the juice. Set aside for a few hours if possible to nicely plump up the dried fruit. 2. Place the biscuits in a food bag and bang the biscuits to crush them into gravel sized pieces with a rolling pin. Perfect for pre wedding stress. 5. Spoon the mixture into the square tin. Pour the white chocolate and pour over the biscuit base. Pop in the fridge for a few hours to set. We cheated with the macaroons. With twenty-fours before the happiest day of our lives and with my history of disastrous macaroon making, Mr Marks and Mr Spencers came to the rescue. 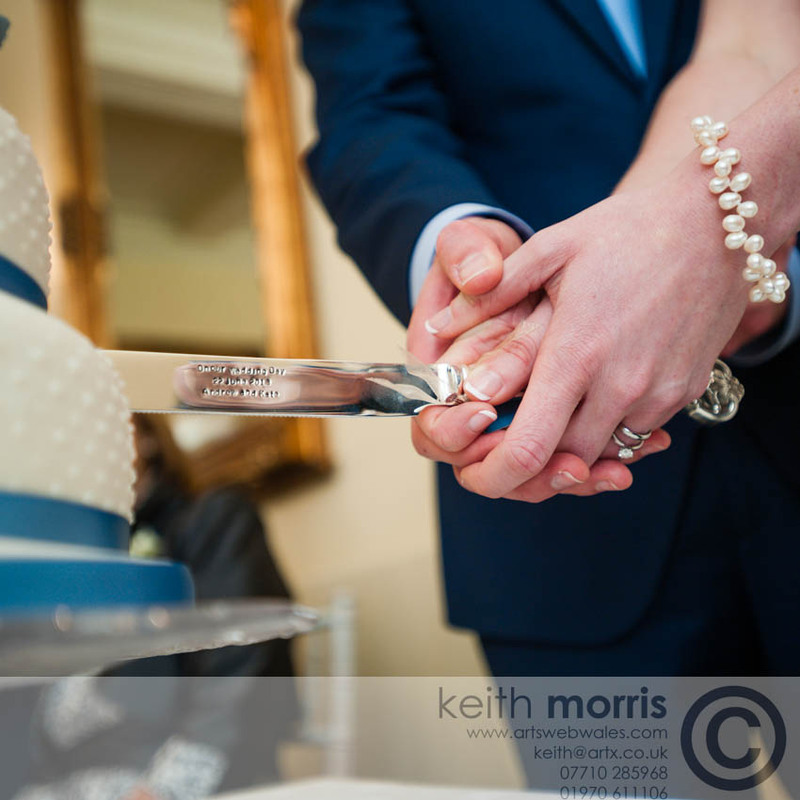 What was your wedding cake like? We're doing table cakes for my brother in law's wedding later this year - everyone has to bring one - it's going to be awesome. Ooh - a cake table! I like the sound of that! 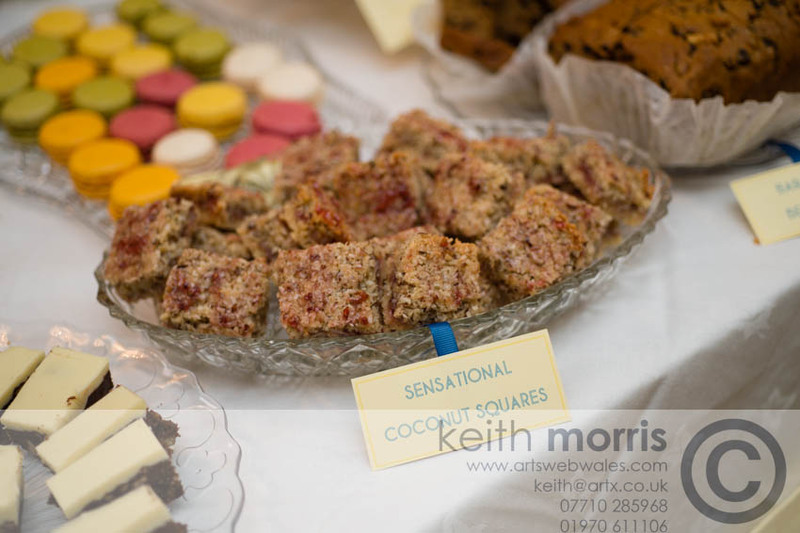 A cake table is a fantastic idea. I went to an engagement party about a month ago and they had the same thing. I spent most of my time stood next to it!!! :D Congratulations on your big day! All weddings should have cake tables, in fact it should probably be made law! 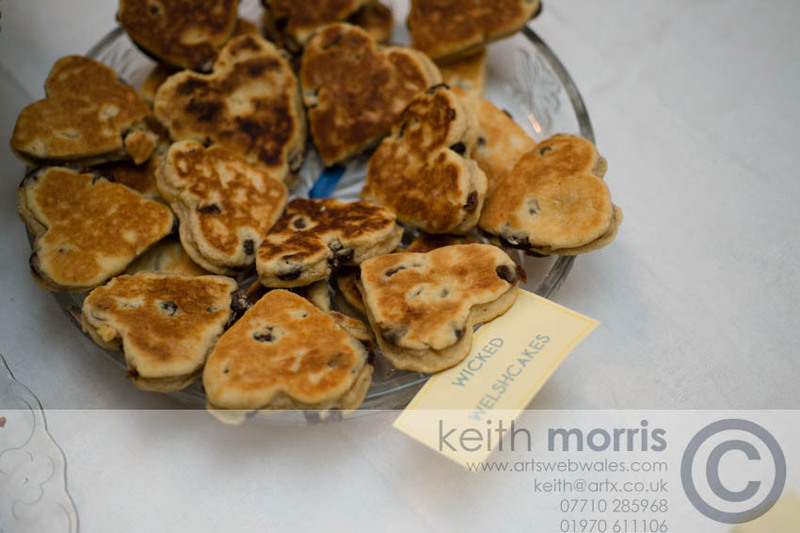 Love your little heart shaped welshcakes, great idea! A cake table - great idea, but a lot of work by the sounds of it. All these pictures are making me hungry!!! Cake is the best part of any wedding, for the guest anyway haha. Cake table sounds like a great idea. This idea of having plates of cake to share is so perfect for a wedding. I would have loved to do this but went for a Choccywoccydoodah cake myself and that was 13 years ago Monday next week! I'm so impressed - well done the cake team (especially Mum for all the baking). I wish I could remember my wedding cake a little better. I know it was cheap - cash was in short supply during the Boer War. Ah what a lovely idea! And fantastic looking cakes! Wedding cakes should much tasty because they are very important things for enjoying this ceremony. These cakes are also very beautiful looking flavorsome.